This post is dedicated to my Master 22/4 Lifepath clients, readers and loved ones. Specific thanks to my inspirational friend Dee, who is a 22/4 born on 11.11, no less! To stay in touch, please join my facebook pages The Numbers Queen or Lifepath 11 (Master 11, 22, 33 and 11:11 numerology). Your Lifepath is your life purpose, or spiritual job description while you’re on the planet. 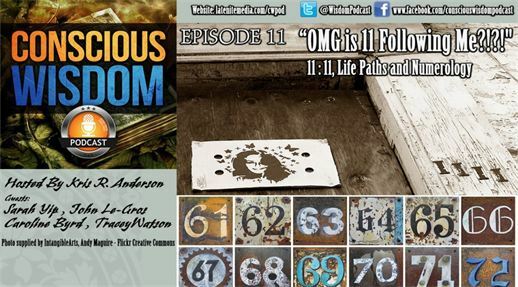 It’s a number between 1-9, or 11, 22 or 33 (the latter are called Master Number Lifepaths – some people include 44). Master Numbers bring double work for potentially double the reward/ karmic brownie points. A Master Number Lifepath is like signing on for a PhD in Humanity, or a whistle-stop tour of life on Earth – it can be intense, especially during childhood. I should know, I’m an 11! We change Lifepaths each lifetime, so it acts as a temporary vehicle for your Soul’s learning. Your Lifepath doesn’t guarantee success – it’s up to you to ‘drive’ it well and stay on track. Your birth and current name/s, pinnacles, challenges and personal years also influence your happiness and success. I cover these in psychic readings as well as numerology workshops in Brisbane (online versions are coming). How do I know if I am a Master Number 22/4 Lifepath? Your Lifepath is revealed by adding your DOB from left to right. Read more on Lifepaths. You generally experience rapid change around your lifepath peak age/ turning point (i.e. 22 years old for Master 22 lifepaths, or 22 and 31 years old for Master 22 lifepath hybrids). For someone born 2 January 1972, we add 2+1+1+9+7+2 = 22. 2+2 is 4 hence we write this 22/4. To me, 22 looks like swans in love. It’s about long-term relationships and creating grace. Someone with a 22/4 Lifepath has free will to live as a 22 (Master Builder) or a 4 (Builder), which may lead them to having different faces at work and home. HINT: If you resonate to 22/4 energy, definitely read my guide to 4 lifepaths for detailed tips, including compatibility etc. In traditional numerology, your DOB must add to 11, 22 or 33 using at least two of the following methods to be a ‘true’ Master Number Lifepath. I am more lenient than this, for reasons explained below. 1) Adding your DOB from left to right (as above). This is my default method for calculating lifepaths (see Dan Millman’s book The Life You Were Born to Live). If someone’s DOB adds to an 11, 22 or 33 using this technique but not others, I talk to them about master numbers anyway. In many cases, they’ve confirmed my predictions. I believe that in these times of 11:11 Ascension, everyone is being stretched to their potential. 2) Reducing the day, month and year first, before adding them. E.g. 2 January 1972 = (2)+(1)+(1+9+7+2) = 2+1+19 = 22/4. This method reduces the chance you are a Master Number and simplifies your numerology. Not my preference. 3) Adding the sum of your day and month to the year. E.g. (2+1)+(1972) = 1975, which adds across to 22/4. Can be useful for finding ‘hidden’ 22 Lifepaths. E.g. the Dalai Lama born 6 July 1935 is a 31/4 or 22/4, depending on the method. I would read him as a hybrid of both, as he has obvious Master Builder qualities. As a 29/11 lifepath, I attract many people with 11, 22, 33, 44, 55, 66, 77 and other double numerology. It’s worth noting that, Master Number energy affects everyone, irrespective of their Lifepath. -address and phone numbers. Read more on addresses. Wherever 22 appears, is where the Universe wants you to cooperate with others on a grand scale. Even if you’re not a 22 Lifepath, reading this article means you’re probably married, related to, parents or friends with a 22. In my books, there are no coincidences, just keenly observed miracles. -All Master Number Lifepaths (11, 22, 33, 44) etc. are PSYCHIC whether they know it or not. 2 represents the 2nd/ Sacral Chakra and intuition/ feelings/ clairsentience. With practice, 22’s excel as spiritual teachers and healers due to their persistence and manifestation abilities. They respond well to past or parallel life healing, as holistic medicine works better for them. Read more on past life regression. -They see 11:11 or repeating numbers such as 11:11, 111, 2:22, 22:22(since it’s their Lifepath), 3:33, 4:44 and so on, once they are ‘ready’ to know their powers. 2:22 and 2:22 is a specific reminder to slow down, detox/ let go, and focus on relationships over results. -Strongly influenced by planets like the Moon and Uranus. Some links to the sign of Cancer – Cancer is ruled by the Moon and it’s the 4th sign in Astrology. Also, WATER adds to 22/4 in Pythagorean numerology (see the system I use). Pros of being a Master 22: Hardworking, hands-on, practical, constructive, persuasive (The 2nd or Sacral Chakra is all about people skills), natural leader and parent, good at relationship-building, strive for long-term results, business-minded (depending on the rest of their numerology/ free will), competitive, energetic and futuristic. Connected to Star People/ Starseeds. That’s why many of us Master Numbers love to ‘starbake’ under the night sky. Famous Master 22 Lifepaths include visionaries such as Bill Gates (28 October 1955, a 31/4 and 22/4 hybrid), Clint Eastwood (31 May 1930), Oprah Winfrey (29 January 1954, a 31/4 and 22/4 hybrid), Sir Paul McCartney (18 June 1942, a 31/4 and 22/4 hybrid) and Sir Richard Branson (18 July 1950). Also Margaret and Denis Thatcher, Kim Kardashian, Demi Moore, Leymah Gbowee (Liberian peace activist), Paul Potts (a singer who won the first series of Britain’s Got Talent), and Sabah (a famous Lebanese singer). Cons of being a Master 22: Like all Master Number carriers, they face additional tests of idealism, ethical conduct and responsibility. Prone to workaholism (WORK, PAIN and GAIN all equal to 22/4 in Pythagorean numerology), notoriety (Kim Kardashian), addictions or allergies (e.g. gluten, dairy, chemicals) and nervous burnout. They need fresh water and good food (preferably organic/ local), often come from complex families and can be sensitive especially with a Girdle of Venus. Remember, being too private can be as risky as being too candid – the heart needs friends to keep it happy! As a builder, you may need to start from scratch in life, or learn to do things systematically before any rewards appear. 22’s can ‘over TWO it’ by trying to hard too make people like them, when their goal needs to be self-care and inner peace. The 4 in their Lifepath can make them stubborn, rigid or aloof (an out of balance 4th/ Heart Chakra is unforgiving). As a palmreader in Brisbane, I’ve discovered that many master number carriers have Composite Whorl fingerprints. They can be indecisive until they learn to trust Spirit – see this article. Sarah Yip – Thanks for sharing your experiences. I’m glad to hear your intuition has brought you to my page, wishing you well with your adventures in synchronicity and self-healing. Sarah Yip – Hi Lily, best to see my Find Your Lifepath page and check out the Master 33/6 articles. Sarah Yip – Hi Amanda, I’ve covered this in the above blog post, please re-read it, best wishes. Follow your intuition for the answer. Sarah Yip – Thanks for your reply Andrea, great to meet another Starseed! Sarah Yip – Hi Yogita have a look at my Find Your Lifepath page for info on 26/8’s. 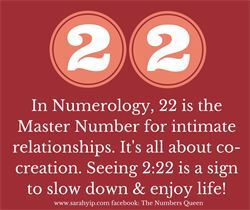 As I mention in the article above, a 22 day birthday will still bring some Master 22 qualities to your numerology. Sarah Yip – Hi Richard, best to join my mail list on my homepage for new articles, or feel free to book a reading. I don’t give personal advice via the blog, for ethical and time reasons. Thanks for making contact. 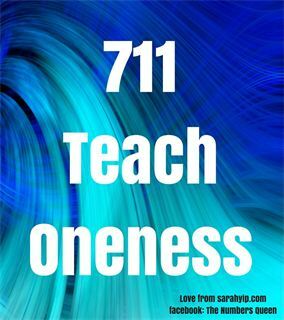 Sarah Yip – Hi Martin, you clearly have many Master Number influences in your numerology so have a look through my blog articles – I write frequently on how people with 11/22/33/44 in their charts can make the most of their sensitivity, intuition and spiritual wisdom. Sarah Yip – Hi Reggie, as mentioned in the article and previous replies, you can have 22/4 energy in other places in your numerology, you might also be a hybrid. Go with whatever resonates most for you and gives you inspiration. Sarah Yip – Hi Jermaine, thanks for your honesty and sharing. You have many qualities of a Master Number lifepath and I can only encourage you to seek support and a spiritual education so you can love yourself on this journey. This article I wrote on the challenges of a double lifepath – A Poem for My Critics – might be a good starting point.